It takes a lot of testing to uncover one really good Facebook ad. Once marketers find it, they scale it, investing more money in just the top-performing ad. Facebook ad fatigue happens when an audience gets served the same ad over-and-over, causing them to ignore it and may even hide it from their feeds. This turns off audiences, hurts ad performance, and increases CPCs. To solve this problem, you have one solution: rotate in fresh ads. By rotating your ads, you get the best ROI and decrease the chances of triggering banner blindness on your audience. In this article, we’ll show you why Facebook wants you to rotate your ads, how to do it, and five examples to inspire you. "Ad fatigue happens when an audience gets served the same ad over-and-over, causing them to ignore it. Thus, leading to poor results." People get bombarded with ads. In the U.S. alone, the average person is exposed to 4,000 to 10,000 each day. The high volume of advertising has triggered a psychological effect known as "Banner blindness.” As the name suggests, people have become blind to the advertisement banners they see in the streets, newspapers, and other media. It's not that consumers hate ads, >they simply ignore them. According to a 2013 study by Infolinks, 86% of consumers suffer from banner blindness. Another study from the Nielsen group found people almost never look at anything that resembles an advertisement, whether or not it's actually an ad. To prevent banner blindness, the Nielsen group recommends making your ads look like a native part of the site. That means you should make your ads look less like an ad and more like a message from a friend. Ironic, but effective. Banner blindness has become our defense mechanism against information overload. While banner blindness describes users’ tendency to ignore an ad because they have grown used to it, ad fatigue refers to the decline in click-through rate and conversion after banners have been left to run for a certain amount of time. In other words, ad fatigue is a symptom; banner blindness is the cause of the problem. In Facebook, you can measure ad fatigue with the frequency metric. The more you show your ads to an audience, the higher the frequency. When Facebook shows your ads to your target audience too many times (which means your frequency increases), your click-through rate drops and your cost per click increases. The good news is, you can fight ad fatigue by automatically rotating in fresh ads. As the name suggests, to rotate ads, you define a piece of your ad, which could include your creative, targeting, or bid, and replace with another piece. For example, you could rotate a headline that says "See Why +10,000 Customers Love Us" with another one that says, "Get A Free Trial of X Today." Facebook rotates your ads automatically. Once you create a series of ads within an ad group, Facebook makes them compete against each other for delivery. 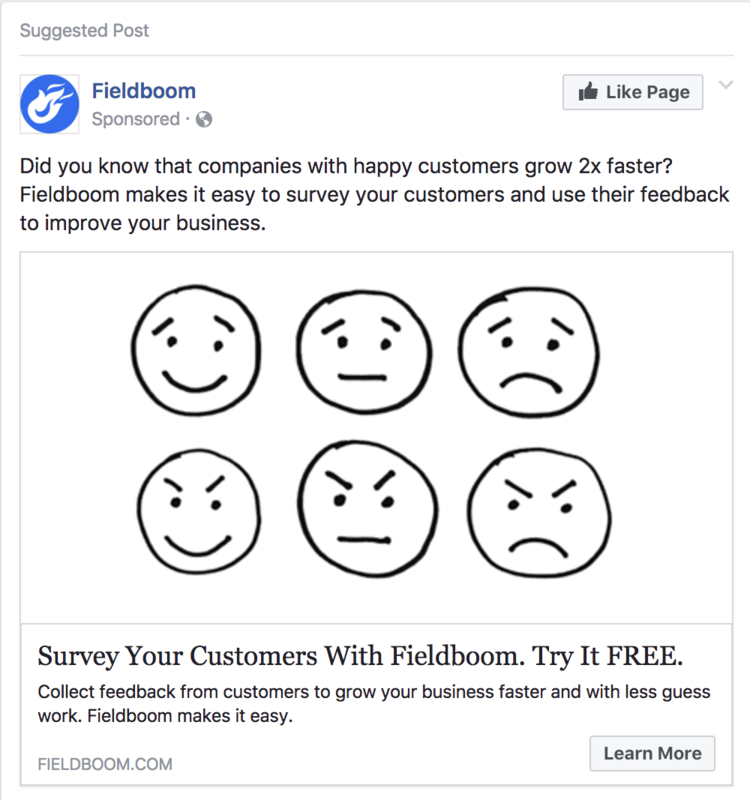 Facebook displays all the ads in your ad set until they find one that works best. When that happens (usually within the first 1,000 impressions), they will show the projected winning ad more often than the others. There's no right or wrong time to start rotating your ads. At the least, try to have two or three ads in the same ad group, in which case Facebook will automatically rotate your ads. Once you hit a winner and start to see a decrease in conversion and an increase in cost-per-click, create a new ad group with the same targeting as the winning one, and add more variations to the winning ad to keep your ad fresh. With Facebook automatic rotation, you can't choose which variation to show your audience. That can be frustrating. With the help of AdStage's Facebook Ad Rotation and Flighting automation, you can display the variation you want in any given time frame. You can rotate one successful ad during the weekends, or you can test different ad variations every week, as well as many other combinations you prefer. If you are having a hard time finding inspiration to rotate your ads, here's five examples to get you started. After decades of testing sales-proof copy, copywriters have found that certain words evoke more emotional responses in the target audience. These are the so-called power words. Adding power words in your copy increases chances of a positive outcome for your ads. “Free,” “now,” “sensational,” and “instantly” are popular power words to use in ad copy. For more examples, check out this list of 189 power words. Take a look at the list mentioned above. Select 5-10 words and use them in your ads. People love getting things for free. That's the power of giveaways. 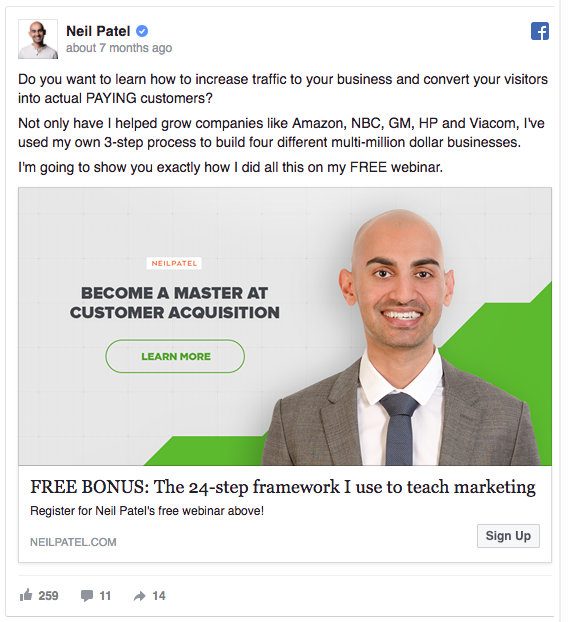 Neil Patel gives away his framework for teaching marketing to convince people to sign up for his webinars. He could reverse his ad and focus on the giveaway in the copy or the description, and add the webinar in the title. He could also mention either the webinar or the giveaway in the image of the ad. Think about what things you could give away for free to your audience. You can repurpose content and package it as a bonus or resource, and give it away in your ad as an extra. Sumo, the email list building, analytics, and social media tool, offers a 40% discount in their accounts with an annual subscription. 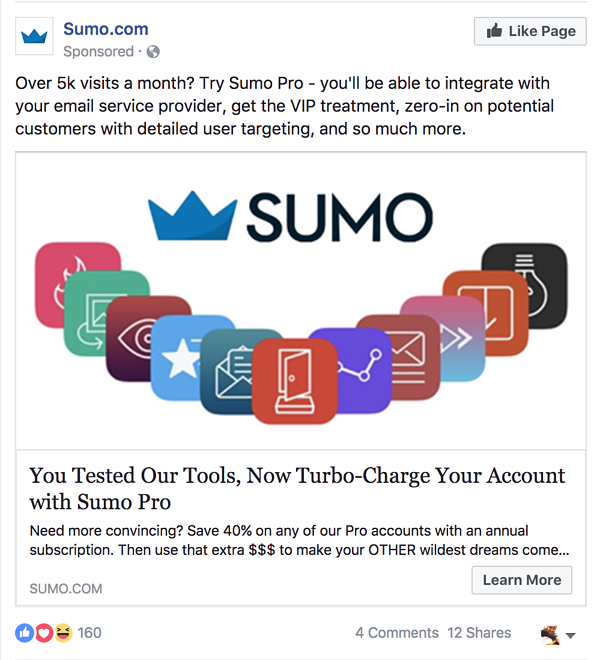 The ad retargets users who have already tested Sumo and may need some extra convincing. 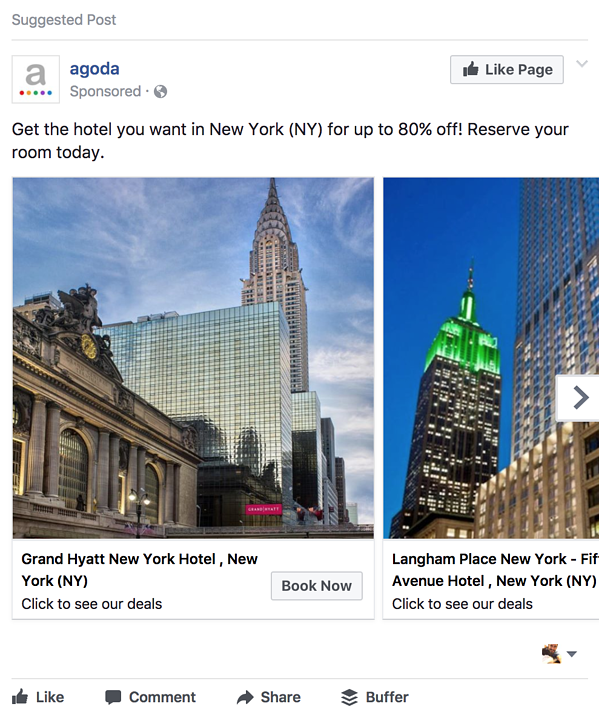 Agoda, a Singapore-based hotel booking website, offers discounts and makes it easy to pick a hotel room right from your Facebook feed with the carousel ad. Scarcity is one of the most powerful economic drivers: what's scarce is valuable. 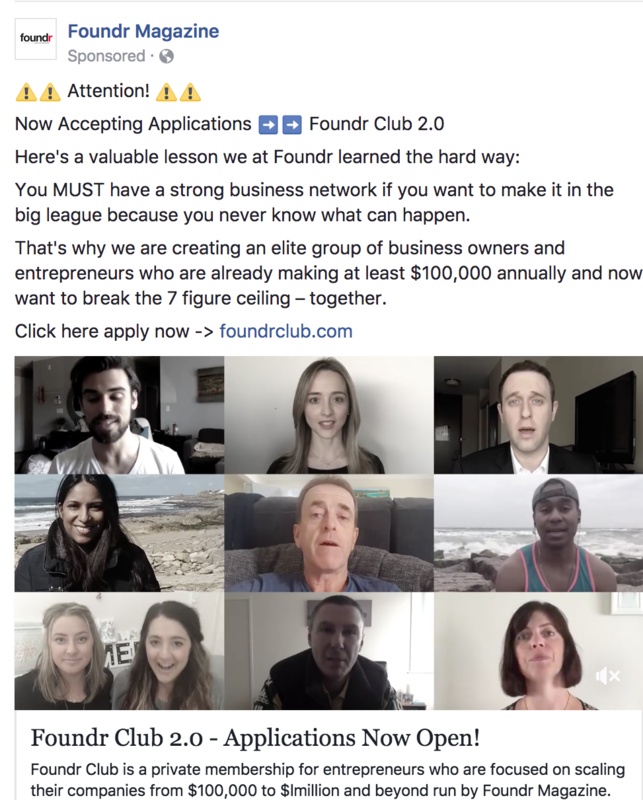 Foundr promoted their Foundr Club 2.0 by highlighting its exclusivity in their ad copy: “private membership for entrepreneurs.” They also use emojis to draw attention to the ad. Make one of your offers scarce. You can show it for a limited period of time, for a specific number of people, or both. Your ads have just a few seconds to catch the audience's attention. 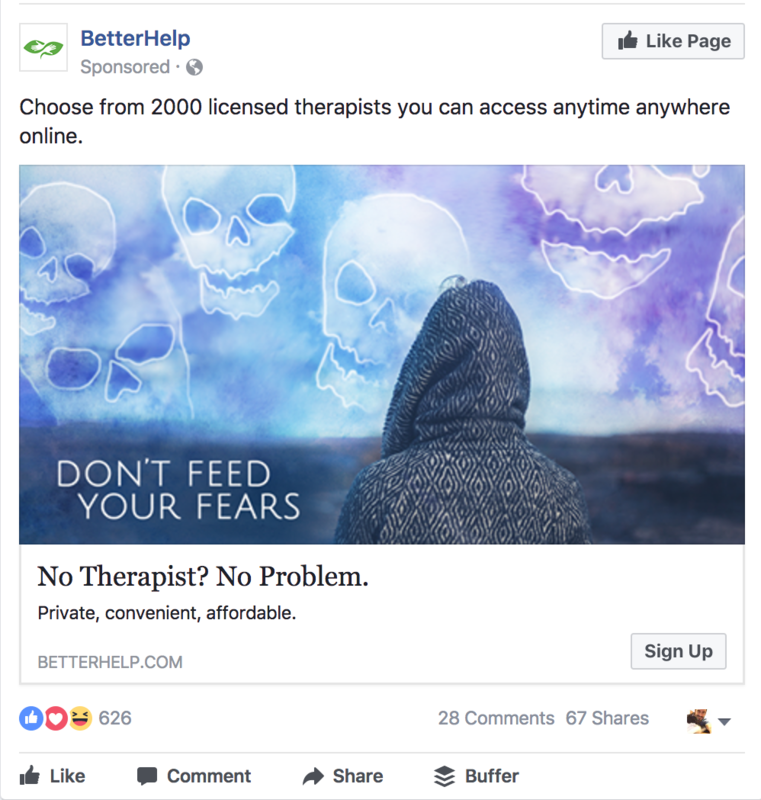 Better Help’s ad keeps the message simple and highlights just the core value proposition: getting therapist help. In the second example, MentorBox promotes a video of the founders. 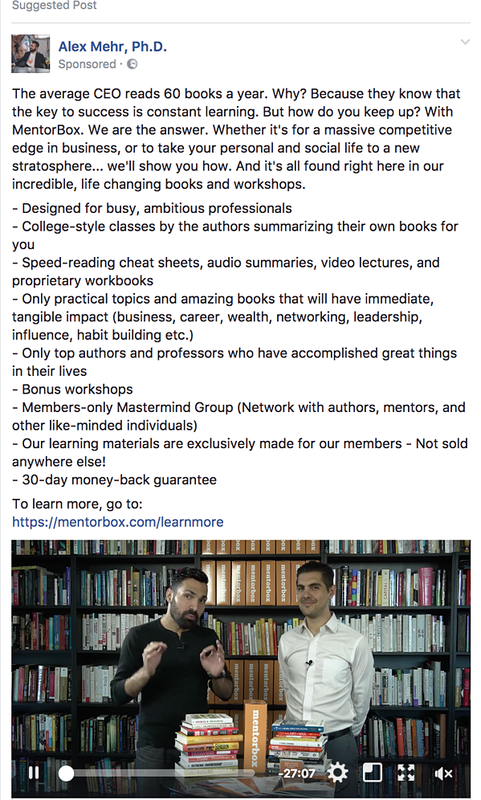 The ad copy is longer than usual and includes all the details of their offering -- a subscription box for business-related books. Play with your ad's length. If you promote short ads, make them longer, and vice versa. Think on the user's stage of the buyer's journey. If your customers are in the beginning, they may need more explanation to your ad's message. If they are closer to the purchase, they may want to use a shorter message focused on the offer itself. Facebook ad fatigue is a common and important factor to consider when running a Facebook ads campaign. Even though Facebook automatically rotates your ads to increase their relevance, you want to constantly experiment with your ads to find the best performing combination. Throughout this article, you have seen five ways you can rotate your ads. To get you started, pick a couple and test them in your ads today.